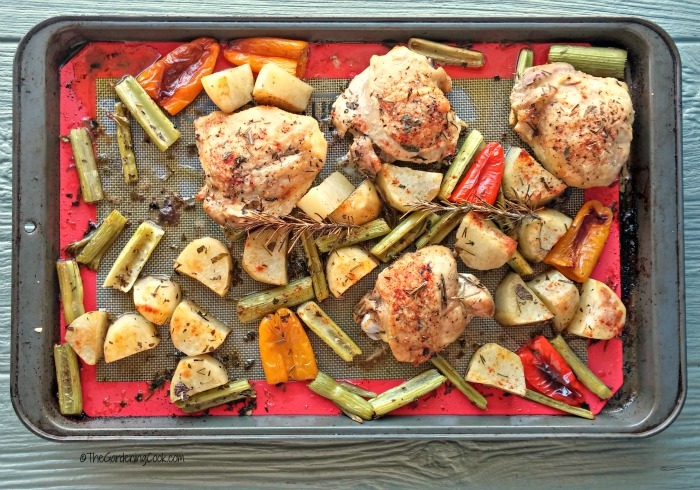 Everything for this one pan roasted chicken dinner is placed on a baking sheet and it is ready to eat before you know it. One pan, easy clean up, fast. Oh my goodness, my mind is going into overtime dinner love for this one! I make roast chicken all the time, but normally I do the chicken separately and cook the vegetables by themselves, either in the oven, microwave or on top of the stove. No matter which way, it’s a ton of cleaning up to do after the meal is done. 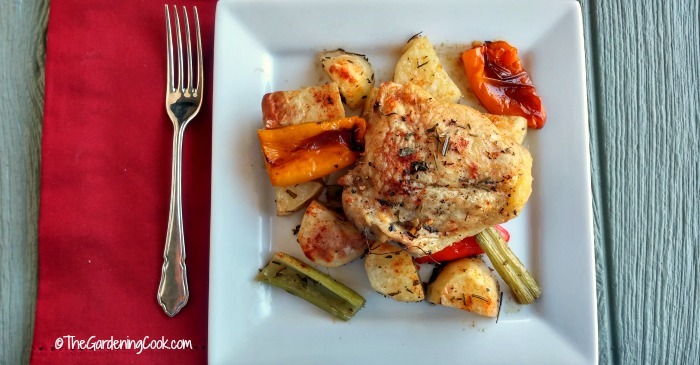 What could be easier than this one pan roasted chicken dinner? The beauty of this dish (other than the easy part) is that you can use what you have on hand for vegetables. Just try and cut them into even sized pieces so they cook evenly. My pantry, today, had celery, potatoes and some lovely baby peppers so that is what the base of the dish consists of. I placed a silicone baking mat on a large baking sheet and added all my veggies. They look so beautiful and roasted veggies bring out their natural sweetness, so I know this is going to taste great. The vegetables get a nice splash of extra virgin olive oil and a dusting of the diced herbs. Then I added the chicken thighs and seasoned everything with Himalayan pink sea salt, Spanish paprika and cracked black pepper. Into the oven the pan goes and I get to sit down and read a book. Well, actually, I get to write this blog post but YOU get to read a book! 45 minutes later and everything looks wonderful! 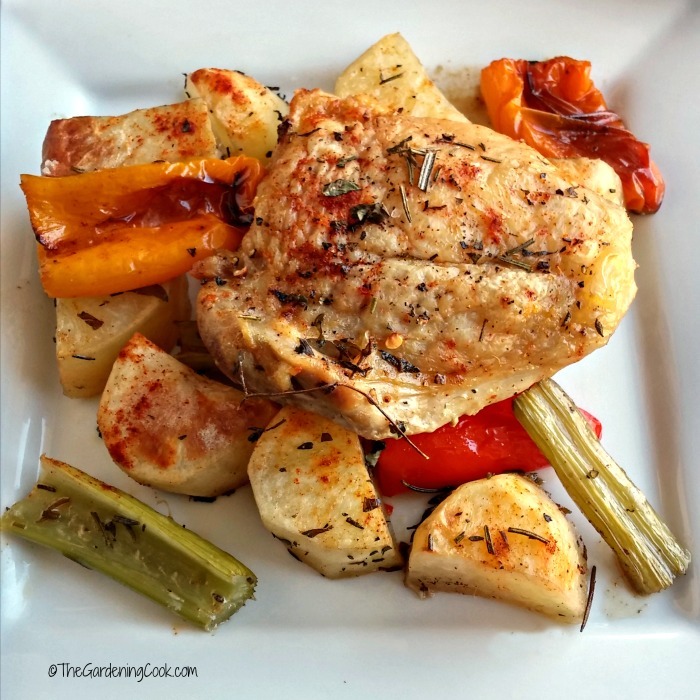 The vegetables have crisped up and have an amazing sweet flavor and the chicken is beautifully browned and so moist and delicious. This meal is one that your family will ask for again and again, and you will say yes, because you know how easy it is to make and to clean up after. Looking for another easy chicken dinner? 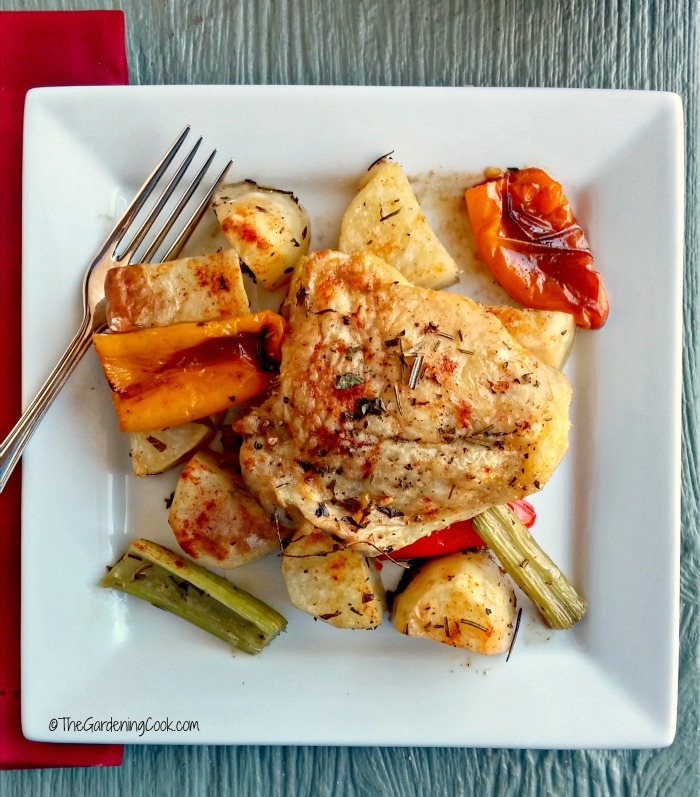 Try this delicious weeknight chicken scallopine. Preheat the oven to 350 º F. Place a silicone baking mat on a cookie sheet. Arrange all of your vegetables on the mat. Drizzle with the olive oil and use your hands to coat the veggies. Sprinkle with half of the fresh herbs. Season the chicken thighs with salt and pepper. Place on the cookie sheet. Sprinkle everything with the Spanish paprika and seasoned salt. 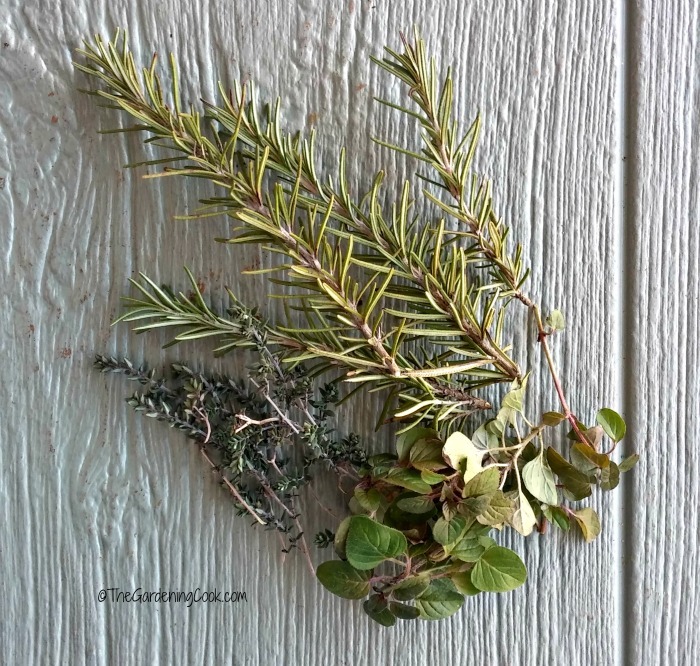 Sprinkle the the remaining fresh herbs. 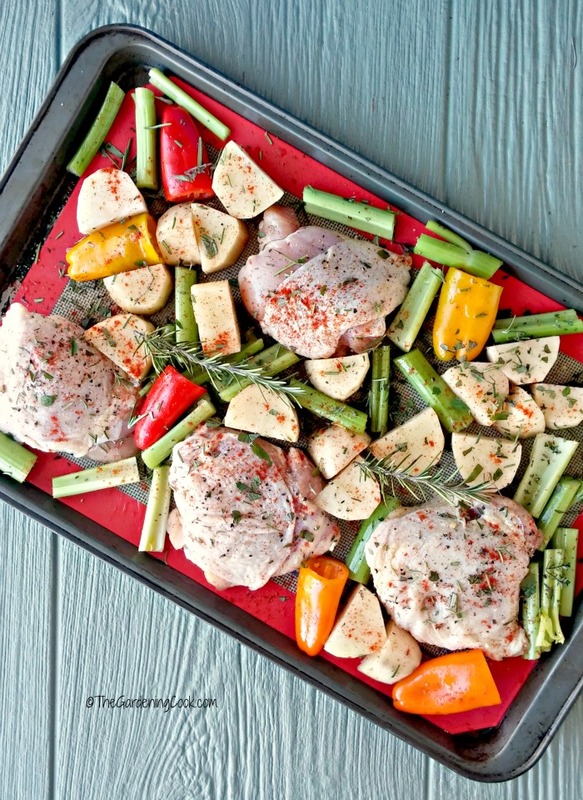 Cook in the preheated oven for 35-45 minutes, until the chicken is not longer pink and the juices run clear. Enjoy! ← Easy Parmesan Chicken – Italian Delight!